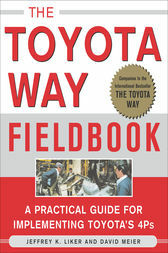 The Toyota Way Fieldbook is a companion to the international bestseller The Toyota Way. The Toyota Way Fieldbook builds on the philosophical aspects of Toyota's operating systems by detailing the concepts and providing practical examples for application that leaders need to bring Toyota's success-proven practices to life in any organization. The Toyota Way Fieldbook will help other companies learn from Toyota and develop systems that fit their unique cultures. The depth of detail provided draws on the authors combined experience of coaching and supporting companies in lean transformation. Toyota experts at the Georgetown, Kentucky plant, formally trained David Meier in TPS. Combined with Jeff Liker's extensive study of Toyota and his insightful knowledge the authors have developed unique models and ideas to explain the true philosophies and principles of the Toyota Production System. Jeffrey K. Liker, the author of the bestselling The Toyota Way, is Professor of Industrial and Operations Engineering and cofounder and Director of the Japan Technology Management Program at the University of Michigan. His work has appeared in The Harvard Business Review, Sloan Management Review, and other leading publications. David Meier is the President of Lean Associates and was Group Leader for Toyota Motor Manufacturing for ten years. He helps other organizations across many industries learn from the Toyota Way.